These 2 or 3-dimensional dies are made of either die steel or brass alloy. 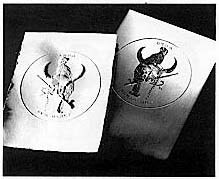 For paper embossing, a high-quality engraving brass is usually preferable. For leather or metals a high-quality, heat-treated die steel is used. 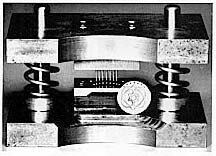 Completed dies are normally fitted into embossing presses or coining machines. Your choice of design and artwork is unlimited. A detailed machine drawing of the die or plate may be necessary for some applications. Our die sets are particularly useful in increasing the production of jewelry and machine parts. A drawing of any shape is all that is required to produce these sets from the finest die steel which has been carefully heattreated to assure durability. These sets can be made to fit a machine like a Roper & Whitney arbor press or permanently mounted in die sets for use in hydraulic or punch presses. In creating the 3 dimensional die your artwork is sculpted into a larger 3-dimensional model. A casting is then made from the model producing a reversed mold which in turn becomes a template. The template is attached to a 3-D engraving machine which engraves the pattern directly into the die steel or bronze.